A people-friendly sized city at the top of classifications as one of the most prosperous and liveable cities in Italy: renowned for the quality of its services and for the industry and wits of its citizens. Position and motorway access: The city, enclosed by the peripheral districts arranged in the hexagon shape of the old ring road (corresponding to the perimeter of the ancient city walls) lies on the via Emilia, adjoining province of Parma to the west and the province of Modena to the east. The A1 Milan/Rome motorway running parallel to the via Emilia, is held to be the quickest and most direct link to the main centres of the region (e.g. 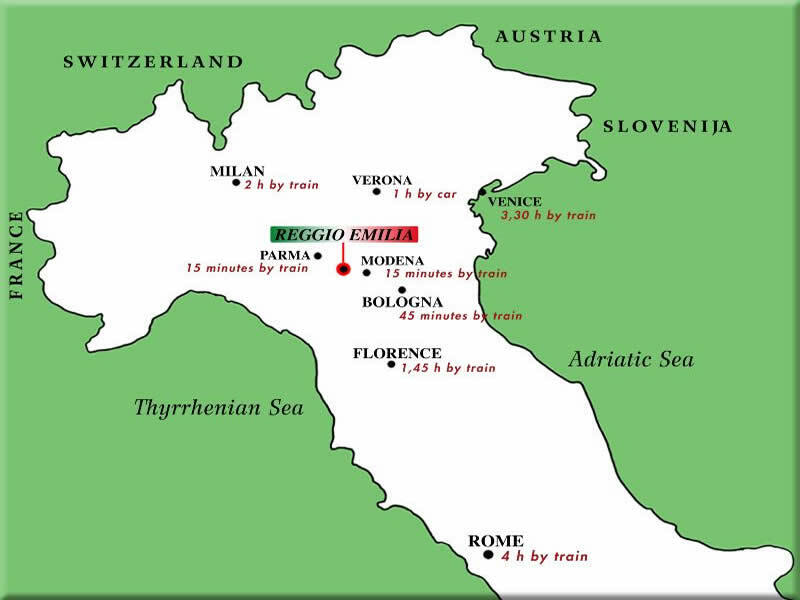 Bologna is about 30 minutes away, Milan 1 hour and a half). The SS 63 main road links the city to the province of Mantua to the north; the same road leads towards the Apennines in the opposite direction (Passo del Cerreto and La Spezia). The city is linked to Sassuolo via the SS 467 in the direction of the Modena Apennines and with Correggio and Carpi by the SS 468. With the arrival of the Romans, at the beginning of the II century b.C., Reggio Emilia (Regium Lepidi) became an urban centre as part of the road network built along via Emilia, while the surrounding plain was drained and settled. Scattered remains testify to a period of intense economic activity for the entire imperial period until the barbaric invasions. From the 8th century, the continuity of civil powers and the permanence of the urban structures were guaranteed by the Bishop. In the 9th century the heart of Matilde's domain was the Reggio territory, fortified by an imposing series of castles. In 1077 one of the most famous episodes in the war of Investitures took place within the city walls of Canossa: the Emperor Henry IV, in the guise of a pilgrim, appeals to Pope Gregory VII for the annulment of his excommunication. Meanwhile, the free municipalities are being born on the ashes of feudalism: Reggio is among the first. At the beginning of the 15th century, it comes under the power of the Este Family. Prominent figures mark the Renaissance period of Reggio: from Matteo Maria Boiardo, the Count of Scandiano, the great poet of Orlando Innamorato, who was governor of Reggio towards the end of the 15th century, to Ludovico Ariosto, the great poet of Orlando Furioso, born in Reggio in 1474. The 17th and 18th centuries were tormented by wars, plagues and the plundering of works of art. In intervals of peace, the creativity of Reggio citizens expressed itself in the construction of sumptuous palaces and many religious buildings, prominent among which is the striking Basilica della Ghiara, erected in the first half of the seventeenth century with the contribution of exceptional artists and the amazing development of silk art. On 7 January 1797, Reggio, the first site of the Italian parliament, on the occasion of the birth of the Cispadane Republic, saw the birth of the "Tricolore", the future Italian flag. The spirit of resistance lived on in Reggio during the twenty years of fascism, culminating in the fight for liberation. In recognition of the part played by the city in the re-conquest of freedom, the Reggio Emilia standard was decorated with the gold medal for military valour.